This paper by Peter Barabas, Wei Huang, Hui Chen, Christopher L. Koehler, Gareth Howell, Simon W.M. 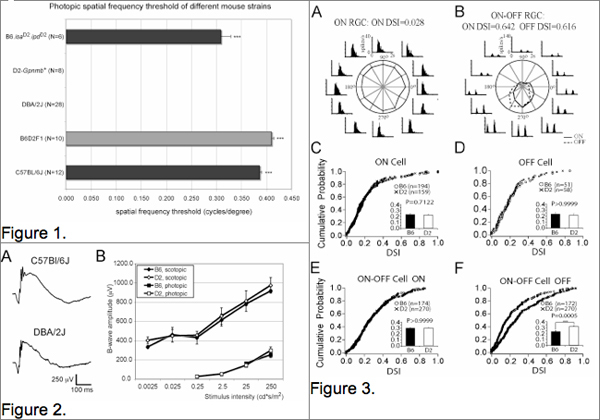 John, Ning Tian, René C Rentería and David Križaj is an outcome of an attempt to follow glaucoma progression in the DBA/2J mouse model of a naturally occurring, late onset form of glaucoma. Ideally, a non-invasive technique should be used and in this case, they used a device to take advantage of the optomotor head turning reflex to assess progressive loss of vision. This reflex is very similar to the involuntary rotation of the eye in response to a rotating visual stimulus and it is present in all animals from fish to mammals (including humans). Interestingly, the DBA/2J strain was found to utterly lack this reflex. The authors investigated in detail the nature of this deficit and found that it is a strain-specific behavioral phenomenon that is not related to the progression of glaucoma. Since the DBA/2J is the most commonly used model of chronic glaucoma and the optomotor test is currently one of the most widely used behavioral tests of mouse vision, this study should serve as a guide to help avoid future confusion in the field.